While it’s not the largest living wall in North America, this vertical garden is certainly one of the most beautiful and diverse vertical gardens out there. 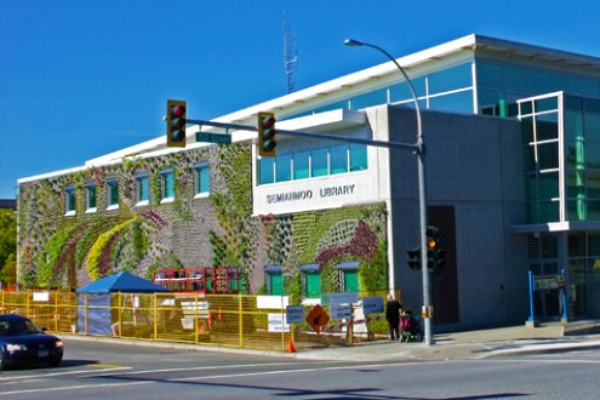 With 10,000 individual plants representing more than 120 unique species, this almost 3,000 sq foot living wall installation on the Semiahmoo Public Library and Royal Canadian Mounted Police Facility in Surrey, Canada has us oohing and ahhing. Designed and built by Vancouver-based Green Over Grey living wall designers, the living wall’s design was inspired by the artwork of the Coast Salish (including Semiahmoo) First Nations People. Green Over Grey’s living wall system consists of a frame, waterproof panels, an automatic irrigation system, and the plants. The frame is built in front of the pre-existing concrete wall with a space behind that allows for air circulation and attachment points to prevent damage to the building. Then the rigid waterproof panels are attached to the frame, which help provide support. The space behind the living wall helps the system breath, provides extra insulation and acts as a sun and rain screen. While it's not the largest living wall in North America, this vertical garden is certainly one of the most beautiful and diverse vertical gardens out there. 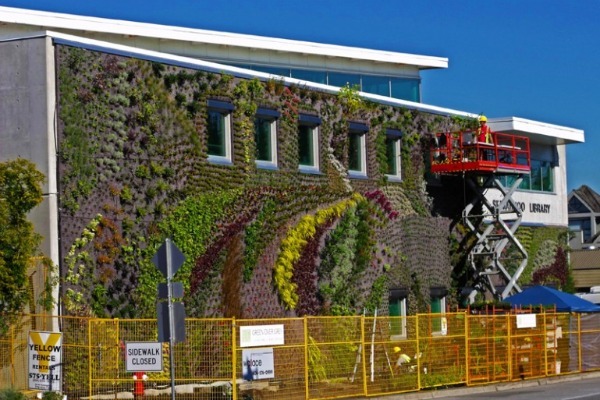 With 10,000 individual plants representing more than 120 unique species, this almost 3,000 sq foot living wall installation on the Semiahmoo Public Library and Royal Canadian Mounted Police Facility in Surrey, Canada has us oohing and ahhing. Designed and built by Vancouver-based Green Over Grey living wall designers, the living wall's design was inspired by the artwork of the Coast Salish (including Semiahmoo) First Nations People.